2. 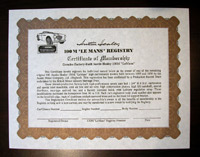 Each new member receives a Brass Dash Plaque showing their car as a Factory Built or Converted Le Mans model. This plaque was designed with the assistance of Gerry Coker to look similar to the dash plaque used on the 100S. Valued at $40. 3. 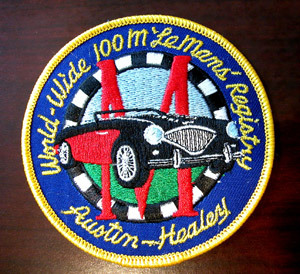 An eight color embroidered 3.5 inch Jacket Patch is given to each new member. These are great for your driving jacket, sport coat, travel bag, etc. The design includes Gerry Coker's Grille Badge racing flag motif. They may also be purchased for $25 each. 4. 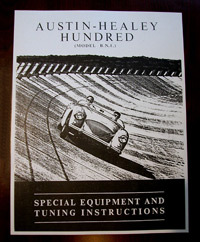 A copy of the Factory Special Equipment and Tuning Booklet is included for each member. This was first supplied with the Le Mans kit. Normally sells for $25. 5. 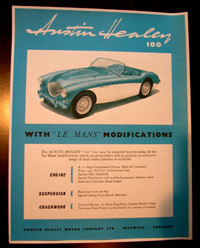 A full color copy of the original Austin-Healey ad for the Le Mans equipped car available from Donald Healey's Warwick factory. Value $20. 6. 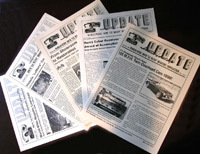 Copies of all six past Registry newsletters chock full of helpful restoration hints, special cars and history of the 100M. Value $20. When you Register as a new Lifetime member for $140 you receive all of the above items worth $230. After you register you may purchase additional items at the above listed price. NOTE: Only one dash plaque is provided per car. It must remain with the car when sold.